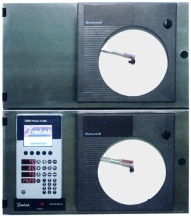 Ensure the accuracy and consistency of your processes with Friedrich's state-of-the-art controls. Our latest control option features a brand new microprocessor, the IMF3000. Combining it with a two-pen wet / dry bulb chart recorder/controller and an internal temperature chart recorder makes this a total solution for control and documentation. The chart recorders also act as a manual override. Developed specifically for food processing applications, the IMF3000 controls conditions in the oven as well as associated systems such as smoke generators, CIP, etc. This latest generation in controls is adaptable to the needs of both simple and complex operations. The IMF3000 was designed for ease of use as a stand alone control, featuring a 5" color display, icon program menu, and quick start keys. During the program cycle, the set points and actual values are displayed. It holds up to 99 programs or a total of 3000 segments. A plug & play memory acts as backup for system setup and programs. Setup and edit programs can be executed through front panel or laptop. Keys and programs are able to be locked out to prevent unintentional changes. For those who wish to take their control process to the next level, the IMF3000 can be integrated with a PC for remote location control or monitoring. The SVS 2000 software that makes this possible also creates a variety of reports, including customized batch documentation and group/flow diagrams presented numerically or as a bar graph. It also has bar code capability. Precise control, great reliability, user-friendly operation. Your components for control and documentation success. The mini-micro is a new microprocessor control. Combining it with a 2 pen wet/dry bulb chart recorder makes this an economical solution for control and documentation for FMP500 and some FMP1000 smokehouses. Developed specifically for food processing applications, the Mini-Micro controls conditions in the oven as well as associated systems such as smoke generators, CIP, etc. The Mini-Micro was designed for ease of use as a stand alone control. It holds up to 99 programs or a total of 3000 segments. Several options are available, including: internal temperature recorder, manual override, and capacity for up to 20 relays. A plug & play memory acts as backup for system setup and programs. Precise control, great reliability, user-friendly operation. Your components for control and documentation success.